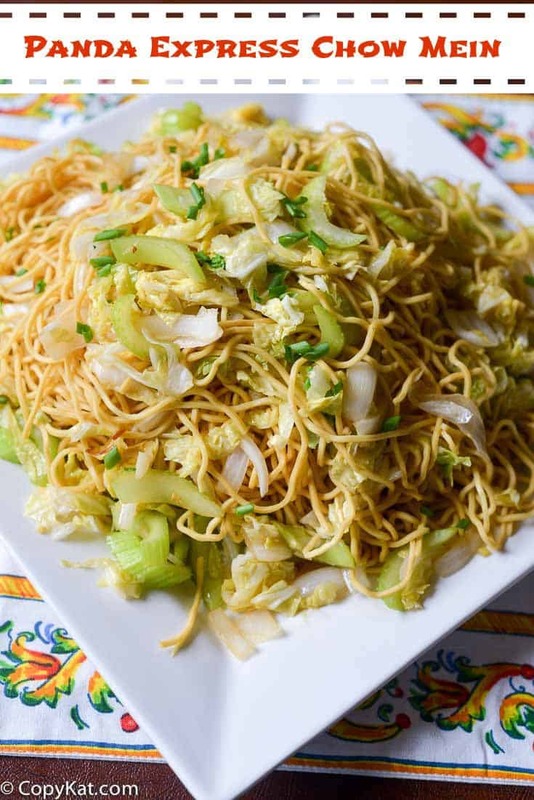 Panda Express Chow Mein is one of the of their most requested side dishes. You can make this at home, and when you do, it tastes even better than it does in the restaurant. Panda Express has to be one of my favorite fast food restaurants. They make everything there with fresh ingredients. Everything is made fresh all day long. Perhaps in you are an area where you don’t happen to be near a Panda Express, but you still want their chow mein, I want to help you unravel this mystery. If you live in a large metropolitan area you can find lo mein noodles in the refrigerated section of your grocery store. Many large grocery stores carry these noodles. I went to my Asian market to get mine, they are inexpensive, and they make a large amount if you use the whole bag. If you can’t find the fresh noodles there is a dry variety, Yakisoba that will work well. I don’t suggest using pasta noodles, you really need this type of noodle the wheat flour holds up better than the noodles in the Italian pasta. This recipe contains cabbage, if you have it available I think the nappa cabbage tastes better, if you don’t have it on hand, you can use regular green cabbage, your choice, but I think the nappa is closer to what is served. The recipe also will need white onions, and celery. This dish is made up of a lovely Asian sauce. You can find these ingredients at your local grocery store. Any store with a tiny Asian section will have these ingredients, and this makes up a delicious stir fry sauce that you will love in any stir fry recipe. We are going to use cooking wine, I like to pick this up in the Asian section of my store, if you don’t have that on hand a dry Sherry will work. We will also need Oyster sauce, Hoisin sauce, ginger, garlic, and green onions. Don’t worry you can use the Oyster sauce and the Hoisin sauce in many other dishes. They add a lot of flavor to sauces, and they make some most excellent ribs. Now we are ready to make this dish inspired by Panda Express. If you enjoyed this dish I hope you try these other dishes inspired by Panda Express. Don't live near a Panda Express? No problem. 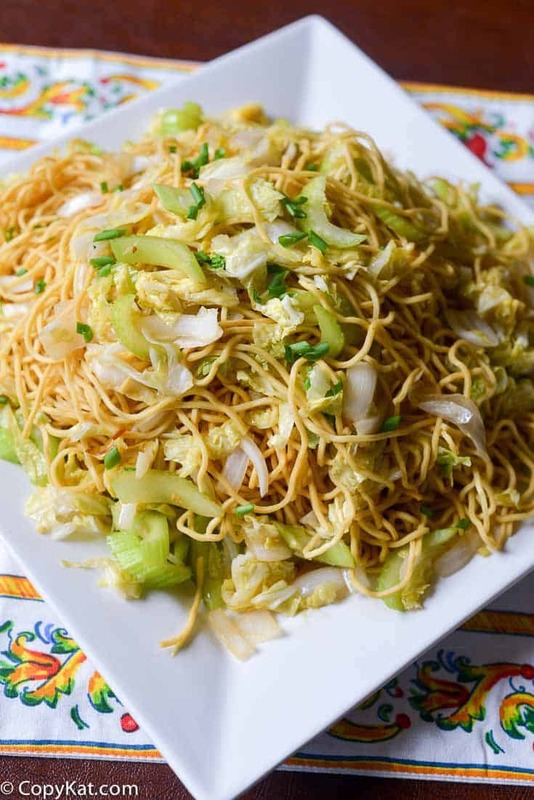 Make your own copycat Panda Express Chow Mein at home. Prepare lo mein noodles by placing in boiling water. Cook according to package directions. When noodles are done, drain them. Fried noodles are quite attractive. look very delicious. I appreciate your cooking skills. Panda Express says their chow me in is vegetarian. Do you think they use oyster sauce?? Is it really necessary? What is a good substitute for it? My family loves it, so I’d love to try to make it at home. Thanks for this!! Maybe you can use some fermented black beans, I think there is a something that is missing without the oyster sauce. The chow mein isn’t vegetarian. The basic sauce used contains a meat base. There isn’t oyster sauce. Just salad oil, soy sauce and shoaxing cooking wine. I love your recipes – but the site is so loaded with ads it’s very hard to scroll through. I found that you can click off the are which makes for easier scrolling. Hope this helps. This is very good; but both times I’ve made it, the noodles are soggy (which is odd, because I usually have to cook noodles a minute extra) Next time, I will boil them a minute or two less- especially beings they cook for a couple minutes as a whole dish at the end. I don’t have hoisin sauce, cooking wine, or sesame oil. So, I either omit the hoisin or use more oyster sauce, use beef broth in place of the wine, and use vegetable oil in place of the sesame oil. Lastly, the most recent time I made this, I only made half a batch, which was enough for the 5 of us with leftovers. Sooo. .. where’s the recipe??????? do you have the resipes Kung Pao from Panda express? I have the beef and broccoli, and the cheese puffs. More to come later. Stephanie, it was delicious! You never said what to do with the other 1/2 of the sauce, so I used it all! I don’t like Panda Express’s chow mein at all but I love their black pepper chicken. Any chance you have the recipe for that? Thanks! I do not have that recipe now 😉 I appreciate the suggestion. this is on my menu for this week, looks easy and I LOVE Panda Express chow mein! This looks incredible! I’m a sucker for a great chow mein! I love this stuff… thank you! Pinned. Thank you for taking the time to do all this!! Hi Stephanie, i love watching your youtube videos, i recreate most of the vegetarian dishes in my kitchen and my family loves all the recipes as they taste just like what we get at restaurants. Can you put a recipe for Vegetarian Lumpia, a Phillipino dish. In past I have added 2 1/2 cups of cook chopped chicken when the cabbage was put in the wok. We always seem to have extra chicken available and this works very well in this recipe for us. Your addition of chicken would turn this into a complete meal. Stephanie, you mention oyster sauce and hoisin in your text but not in the ingredient list. how much and when do we add it? Thanks for noticing. I have added in there.